And he apparently was a beautiful boy when he was younger, but as the doctors point out, crystal meth does things to your brain. One of the things, of course, is addiction. Nic (Chalamet) is engaging and attractive, and likes to have fun with his younger half-siblings. He makes good grades, and is optimistic about his educational future. He has a very close relationship with his father David (Carell), and their family is financially well off. Nic’s stepmother Karen (Tierney) has doted on him from the beginning. There is no lack of love in this family. So…what could go wrong? This film is excellent in showing the ravages of drug addiction across a family, even when everything else is about perfect. It’s an important point today when addiction is such a major problem, and this film is meant to show that it can happen to any family, even those who are strong in every way. The stereotype of drug addiction is of a disadvantaged, racial minority; but now, it seems to have invaded diverse groups of people in the U.S.
Beautiful Boy is the story of a gifted boy who, for some unexplainable reason, gets involved in drugs. In Terry Gross interviews (NPR’s “Fresh Air”) with the actual father and son, whose memoirs form the basis for the film, a physician explained that some people’s brains are more susceptible to addiction and its effects, particularly teenagers, whose brains are still developing. Perhaps that accounts for what happens to Nic. In short, he is in and out of drug use and rehabilitation, and this goes on for years (from age 17 to 23). There are desperate calls usually to his father, episodic good times with his family, starts and stops with college, and the gradual wearing down of them all. In addition to their own let-down feelings, David and Karen have to deal with the disappointments of their children when Nic doesn’t show up for special events or leaves abruptly from family gatherings or pilfers cash and sellable items. Nic’s biological mother Vicki (Ryan) is brought in to help at one point, but it becomes clear that it will take some kind of resolve on Nic’s own part to get his life back on track. Carell’s performance as an understanding, patient father is commendable for his capturing the angst, love, and bewilderment that a father undergoes in these circumstances. The supporting figures Maura Tierney and Amy Ryan are likewise strong in their roles. Chalamet, who has become almost an iconic symbol of a physically attractive, sensitive young man, takes on the depleted, desperate look and demeanor of a drug addict (losing 25 lbs. to prepare) just to the point where you will still be sympathetic toward him. He is an actor with a great future ahead. Despite its high quality of filmmaking, Beautiful Boy may not make it to awards season. I attribute that primarily to the subject, which is depressing indeed—not excitingly dark—but simply depressing. I applaud the filmmakers for capturing the addiction experience so well, it almost looks like a documentary. A profoundly emotional—and realistic—account of drug addiction and its far-reaching effects. Stevie (aptly played by Suljic) is a kid you immediately feel sorry for, and that’s often how the other characters in the film relate to him. And he really needs it in order to escape a bully brother at home and to fit in with a rough group of street kids. This quality gives him entry into the group in the beginning, but ultimately it’s his fearlessness that wins him respect. He’s smaller than the other kids and desperately practices to ride a skateboard, the tie that holds the group together. It’s a colorful group, most with nicknames, and it’s Ruben (Galicia) who first helps Stevie into the circle with unhelpful (wrong) advice and an order for Stevie to bring him $40 for a skateboard he wants to sell. We soon meet the one calling himself Fuckshit (Prenatt)—or he got that name from saying the word repeatedly, followed by “That’s dope.” There’s the one the group regards as rather dim, so he gets the nickname Fourth Grade (McLaughlin), but he does hope to make a film one day, so his camera is a steady companion. The standout—and the only one with good sense and aspirations—is African-American Ray (Smith), who is working hard at becoming a pro skateboarder. He can break up fights, show empathy and understanding, and serve as a role model, which largely passes over the others, but is a kind of salvation for Stevie. Jonah Hill, the writer/director, wants to depict life in the 90’s in L.A. when he was growing up. He captures this seemingly very well (it wasn’t my world, so I can’t really judge), and perhaps wrote the Stevie character from his own experience of making efforts to fit in with a group. (I’m inferring this from his bio in which he contrasts himself with Brad Pitt.) The composers Trent Reznor and Atticus Ross augment the 90’s feel with their music drawn from or based on that period, although I found it to be too heavy-handed at times, particularly when other sound effects were combined with the music. 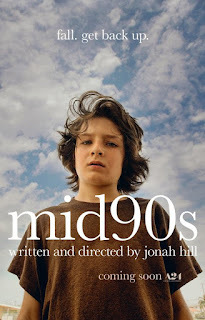 For me, Mid90s has an unfinished quality; the strains of each character are incompletely told. We hear a bit about their home life and who they are, but not enough to get a firm picture. For instance, we’re told about Ruben’s parents abusing him and his sister, and similar “one-shot” descriptions for others, but are told essentially nothing about Ray who, with Stevie, was the most potentially interesting. The characters played by Lucas Hedges and Katherine Waterston are sadly lacking in description and in action. Their roles should have been greatly expanded for us to understand their behaviors. Both actors are greatly underutilized, which is a shame, considering their talent. 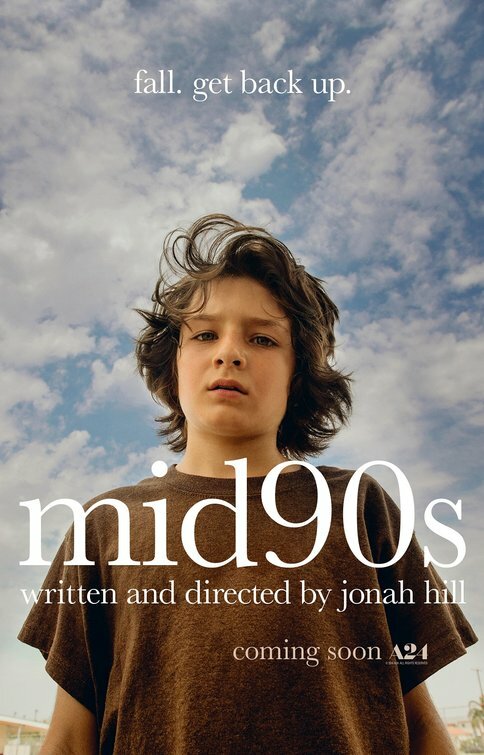 I don’t know if Jonah Hill intended to paint such a bleak picture of kids in the ‘90s in L.A., but I found this depiction very sad, with kids trying to make their way with little guidance from family or school. When Stevie’s mother says, “We used to talk!”, wanting to know more about Stevie’s new-found friends, I could empathize completely. There is little here to inspire; what’s missing is any kind of moral or insight to bring the story home and give it meaning. A boy without much of a family makes one with skateboarders on the street. Stars shine so bright on their way up and glow brilliantly for a time, then begin to fade. Popular rock star Jack expresses this to Ally when she is on her way up to stardom and he realizes his star is waning. This is a story beautifully told (and sung) about a major rock star stumbling onto an undiscovered talent and recognizing her value, which she does not as yet recognize. Their lives intertwine in a hot romance that is touching and real, and then they must confront the stresses attendant with established and new fame side by side. Bradley Cooper, co-writer and director, co-stars as Jack with Lady Gaga as the ingénue Ally. Gaga shines as a street-wise but innocent budding artist who devalues herself, her voice, her writing, and her looks. (As per usual, the comments about her looks sting her the most and undermine everything else.) In her favor is a devoted, admiring father who has given her a solid background. Cooper is the rock star Jackson Maine, with a huge following and fans everywhere who know him. 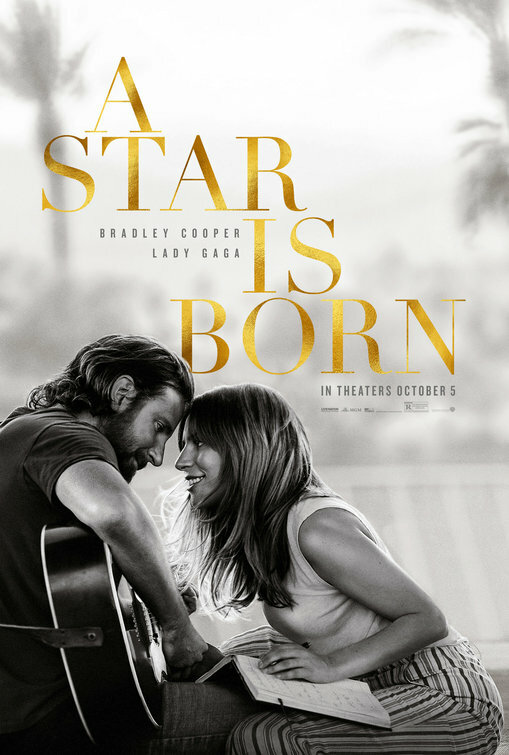 The first part of the story charts the musical and sexual attraction between the couple, and its fun to see this and see the chemistry between Cooper and Gaga. This gets you onboard to root for them and care about what happens to them, despite the warning signs along the way; i.e., his dependence on alcohol and drugs, his conflicted relationship with his brother Bobby (Elliott), the meteoric rise of Ally’s stardom, her artful manager, etc. The signs’ becoming realities in the couple’s relationship tells the rest of the story. Cooper’s directorial debut is clearly a success, with strength of story, cast, music, cinematography, and all the other components of good films. His acting and vocal abilities are at their best, and Lady Gaga meets him in her impressive acting debut. She is a well-established and beloved singer-performer, and to see her ace an acting role is rewarding. Sam Elliott as Jack’s older brother is sterling as he usually is in a role that fits perfectly. All three stars are getting early Oscar buzz. Much should be made as well about Matthew Libatique’s cinematography, so original and artistic in presenting the concert scenes. His work has a certain mystique about it that pulls the viewer even deeper into the story. His first-class filmography includes Black Swan, Pi, The Fountain, and Mother. This movie will play well for general audiences, but it has enough artistic merit in its craft to warrant a higher designation, that of a film worthy of a remake. 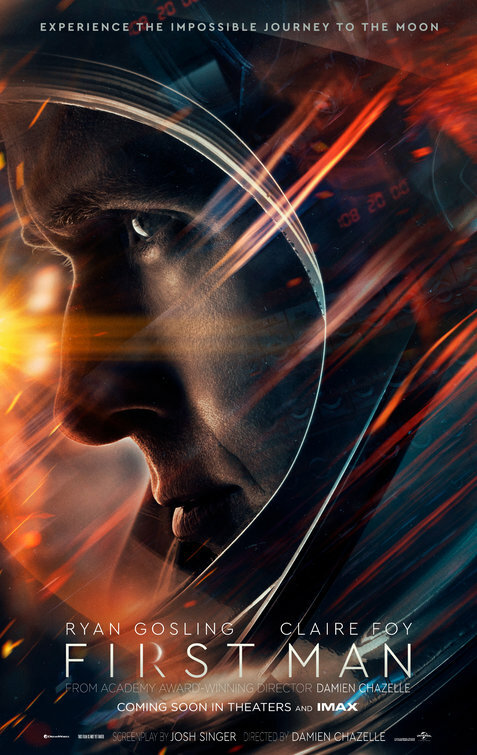 First Man is Damien Chazelle’s sharp turn away from the musical orientation of his previous hits, Whiplash and La La Land. We do see one tender song piece near the beginning of the movie when Neil Armstrong dances nostalgically with his wife. Thereafter, our ears are bombarded with the roars, bangs, creaks, and groans inside spacecrafts. What he has retained in this account of NASA’s efforts to land a man on the moon before Russia in the 1960’s are intense interpersonal relationships fraught with passion, nerve-wracking episodes, and grief. More than anything, the film gives an inside look at the early space endeavors, their costs in human life and money, the intense pressure all immediately involved and their families experienced, and the mixture of bonding and competitiveness that took place among the astronauts. It presents a brilliant picture of how men work together in a competitive, high-pressure setting, which is likely to be in contrast with how women relate to one another in such an environment. (I’m thinking specifically of the women in the film Hidden Figures, for example.) Here, there’s camaraderie, but little of the deep emotional sharing we saw in the earlier film, and much more competitiveness. First Man is as well a portrait of the heroic astronaut Neil Armstrong (empathically played by Ryan Gosling), who became even more reticent after the death of his daughter, as perhaps his way of dealing with the grief. He’s a man who doggedly pursues his goals without being deterred by setbacks, does not hesitate to use his own judgment in place of what he is told to do, and although his emotions are tightly hidden and controlled, this defense can be broken through in certain circumstances. The latter achieved by his wife Janet (Foy) in a scene that highlights her influence, and may be an award-winning performance for the actor. Chazelle has also retained two colleagues from his previous films, composer Justin Hurwitz and cinematographer Linus Sandgren, and brought in Christopher Nolan’s notable production designer Nathan Crowley, to create a powerful account of the subject that is both extravaganza with awesome special effects and deep emotional pulls. The movie, based on James R. Hansen’s book, can be regarded as of historical value for young people and those seriously interested in U.S. space programs. It’s a serious account that is fascinating and entertaining as well. A small downside could be the extended scenes inside the spacecraft, which are so noisy it’s hard to hear the dialog and the mechanical focus in the picture is not informative as to what is going on. I read that in fact it is so noisy inside a spacecraft some astronauts experience hearing loss, so these scenes are not unrealistic; I just have some concern about my own hearing! A fascinating and apparently realistic look behind the achievement of getting a man on the moon. This film is so unrealistic it becomes meaningless. 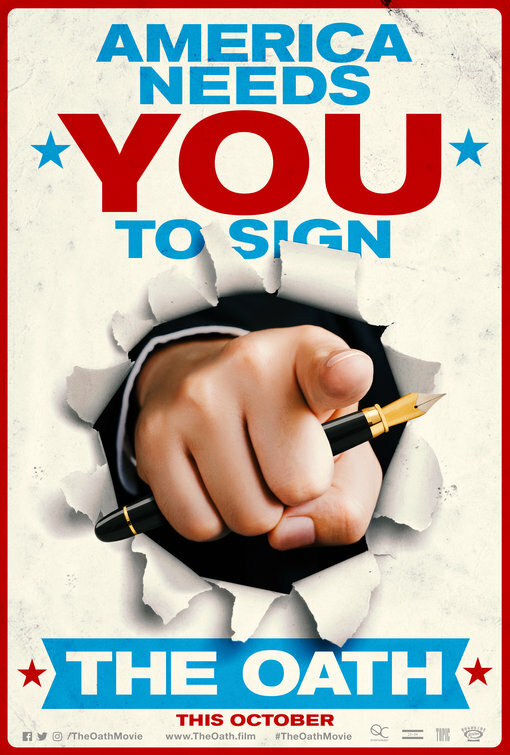 The premise looks promising for an exploration into our politically divided country trying to deal with the film President’s requirement that every citizen sign an oath of loyalty to him. It is timely, in that we hear reports of our current President actually asking directly whether members of his staff are/will be loyal to him. But, unfortunately, writer/director (and star) Ike Barinholtz placed the issue in a family drama that doesn’t even pretend sensitivity or subtlety in its exploration and goes over the top in absurdity. And although I’m sure this is intended to be its “comedy”, few people were laughing in the screening—only a few chuckles. It’s basically an hour-and-a-half of screaming arguments peppered with foul language, threats, and insults. It’s Thanksgiving, and Chris (Barinholtz) and Kai (Haddish) have invited his family to their house. Chris is something of an agitator, vehemently opposed to the oath and compelled to find out exactly who has signed it. Most are in a politically conservative frame of mind and did sign it, but Chris can’t let it go; he incites arguments repeatedly, showing that despite his “liberal” views, he is judgmental and socially insensitive and disrespectful. He has had long-standing conflicts with his brother, and their old resentments add fuel to the fire. Just to make matters worse, up the conflict to another level, (and increase the absurdity), “someone” has reported Chris to the CPU, the government organization within Homeland Security that has the authority to bring people in for questioning. There have been rumors that some people have disappeared after being taken away. So when two agents, Peter (Cho) and Mason (Magnussen) come to the house and are let in when Chris is out of the room, he goes ballistic. The ensuing fracas involves not just verbal and physical exchanges, but a gun, a taser, a couple of shovels, and lots of blood. Although the actors are generally very good, their characters are unsympathetic and often obnoxious. The solutions they, especially Chris, come up with are rather stupid, the most glaring being that despite the serious injuries of one person, 9-1-1 or an ambulance are never called. Surprising to me, the only adults that are sympathetic and sensible at all are Kai and Peter, one of the agents. (A clever casting choice was Haddish, in that in previous roles, particularly in Girls Trip, she is the outrageous one; here, she constantly tries to calm her husband down and give him good advice, which he seldom takes.) Peter talks and behaves like a good government agent who knows how to instill calmness in a situation and is basically honest. Other than these two, the other characters mainly elicit groans. It’s difficult to come up with what Ike Barinholtz had in mind as to the purpose or point of this film. I hear he wanted people to stay mindful of humane values in the current political climate, but when no character in this film seems to do that, its puzzling. Reflective of his background in comedy, The Oath movie feels like an extended comedy routine that goes on too long. Only, instead of comedy, we see a dysfunctional family and suffer through it as we would in a real-life situation with such a group. Finally, of all things about this film that were almost intolerable, the pounding blast of music that marks the countdown from Monday to Black Friday when all oaths should be signed is appallingly bad. Bret Mazur blasts our ears five times just to tell us a day has passed. Charming, but incorrigible, Forrest Tucker’s sociopathic personality comes through when he meets a woman in a diner, and quickly wins her trust. The woman is Jewel (Spacek), a lover of the simple life, horses, and the rolling fields surrounding her property. He is evasive when she asks his name and what he does for a living, and he gives her his real name, which, at this point, is not broadcast in the stories about him, and finally lets her know that instead of “makin’ a livin’”, he believes in “livin’”. It’s obvious that he has an admirable way of blending together truth and fiction into a believable story. And like many who encounter Forrest, many suspect he is lying, but it doesn’t seem to bother them…because he’s so nice! The truth is that Forrest is a bank robber who has been imprisoned and escaped 16 times, beginning when he was just a kid. It’s noteworthy that all the tellers who get robbed describe him as “such a gentleman”, “very polite”, a “nice-enough fellow”, and “happy.” He’s always well dressed and charming, encouraging them, and thanking them for accommodating him. He and his pals, Teddy (Glover) and Waller (Waits), manage to get away with thousands of dollars. They’re in the news, and even the police shake their heads, finding it preposterous that these old men are so capable. Detective John Hunt (Affleck) is the beleaguered policeman charged with apprehending Tucker. Although he seems to be as obsessed with being a good policeman as Tucker is about being a good robber, he is different in his self-doubts and struggles with his occupation. His wife and superiors give him room to quit the force, but he determinedly stays on. Even when the FBI intrudes itself into the case and he has a chance to step back, he doesn’t. Then he gets a tip that tells him exactly who Forrest Tucker is. Robert Redford pulls off this role in his usual expert fashion; probably no one else would be up to his personal aptness and level of skill. It’s rewarding to see Sissy Spacek again in a role that suits her to a T as well. Finally, Casey Affleck likewise performs as the kind of brooding character he has done so well in other films. Danny Glover and Tom Waits make great sidekicks for the Redford character. I was a bit disappointed there is not one of Tom Waits’ songs in the music. Elizabeth Moss has a wonderful cameo at the end. In a way, this film reminded me of David Mackenzie and Taylor Sheridan’s Hell or High Water in the nobility of the robber, but it kept up a level of excitement and humor a little more than is the case for this film. 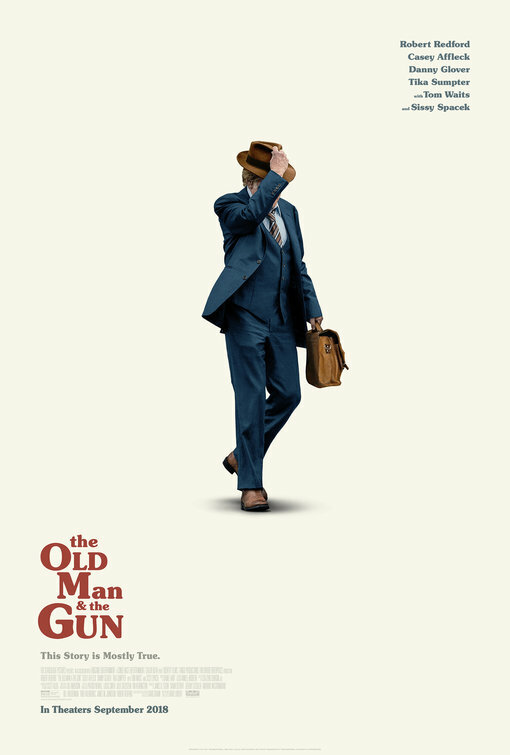 The script for The Old Man & the Gunis based on a true story, which was written up for The New Yorker Magazine by David Grann, who subsequently penned the script for this film. Grann has a way of capturing his audience’s interest and maintaining suspense in his writing, just as he did for The Lost City of Z, The Devil and Sherlock Holmes, and Killers of the Flower Moon: The Osage Murders and the Birth of the FBI. In Director David Lowery’s capable hands, the movie becomes worthy of Robert Redford’s distinguished reputation in filmmaking, and a fitting tribute if it is indeed his last acting role. Daniel Hart’s lyrical, moving score puts finishing touches on this fine production. Charm is the name of the game in this engaging, suspenseful story. Despite its title, this film is not essentially about Pablo Escobar; based on the TV anchorwoman Virginia Vallejo’s memoir about her love affair with him, it covers her gradual realization of who he actually was and the ways in which their relationship affected her life. In the beginning, she is so charmed by him and impressed with his philanthropic goals, she says to herself she doesn’t care how he makes his money. But after his dangerous operations become more and more obvious, disillusion sets in. My understanding of the public’s continual fascination with Escobar through the years (as shown by the popularity of movies and TV series about him—such as El Patron, Paradise Lost, The Infiltrator, and Narcos, as well as more than 15 books—has more to do with interest in the risky business of selling drugs—especially in a cartel—rather than in the man himself. Penelope Cruz as Virginia narrates much of the film in a voice-over, so it is clearly from her point of view. In this sense, Loving Pablo falls far short of previous renditions of the famed drug lord because it really is about the romance, and doesn’t get much into Pablo’s business dealings. There are definitely very violent scenes (and one notable distribution scene that takes place on a blocked highway) meant primarily to illustrate what made Virginia Vallejo anxious, but these scenes are not explained very well, and Pablo (Bardem) is shown much of the time as a passionate lover and family man and his brief flirtation with politics. The affair lasted for five years, but the movie omits some events and insights that could have made it more compelling. For instance, there was the impression that Escobar was using Vallejo’s television popularity to advance his standing in the country and provide him with a philanthropic cover to conceal his drug dealing. Second, one reason for their break-up was his becoming so incensed when he learned that she had other lovers, he refused to see her again despite her wish to reunite. Finally, little is made of the fact that Escobar was married, although there are a couple of scenes where his wife expresses her discontent with the situation. As an account of an extra-marital romance, there is little of interest here, so viewers expecting more of the Pablo Escobar story will be disappointed. As fine actors, Bardem and Cruz elevate the film to make it a little more entertaining, but there is not much of a reason to see the film. Pablo Escobar’s five-year romance with a popular television personality and what came of it.